Ukraine is reportedly failing India with upgrades to its An-32 transport aircraft. At least five planes have allegedly gone missing in Ukraine. Meanwhile, work on Indian soil has been halted after Ukrainian engineers were pulled out. The Indian Air Force sent 40 An-32s to Ukraine to be upgraded at the Kiev-based state-owned Antonov plant under a 2009 service contract. But the last five of them have become “untraceable,” an Indian Air Force official told Defense News. Another 64 An-32 had to be upgraded locally, but Ukrainian engines tasked with the job departed and the supply of spare parts stopped, he added. "These five aircraft are almost lost as it is difficult to trace them and diplomatic efforts to find their whereabouts have failed," the anonymous official is quoted as saying. Earlier Indian Defense Minister Manohar Parrikar said the last batch of An-32s sent to Ukraine for upgrade had been “stuck” there due to the ongoing crisis, Economic Times reported. The contract to upgrade India’s fleet of An-32 is worth $400 million and was expected to run through 2017. The goal is to increase the aircraft life expectancy from 25 to 40 years and provide it with improved avionics, a modernized cockpit and an increase in capacity from 6.7 to 7.5 tons. 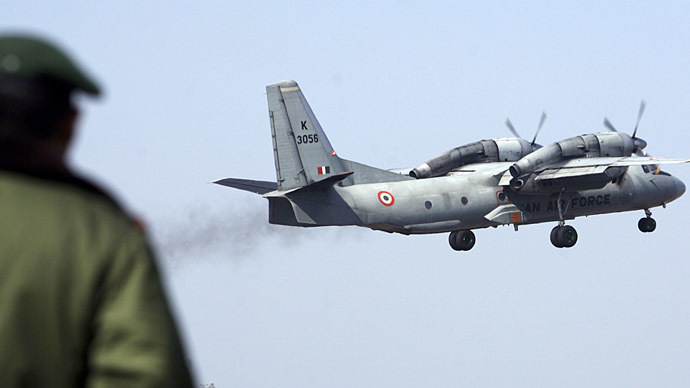 "As AN-32 formed the bulk of the medium-lift segment of the transport fleet, urgent replacement of the Avro fleet, finalization of the joint development of medium transport aircraft and possible fresh purchases are some of the options which IAF will need to work on an urgent basis," commented retired Air Force wing commander Bhim Singh. The military news website contacted the Ukrainian embassy, which said Antonov must resolve this issue with the Indian Air Force on its own. The company would not comment on the issue. India’s defense ministry has denied speculation that its An-32 transport planes have been going missing in Ukraine. “Media reports about the Indian military aircraft disappearing during the modernization are unfounded. This is confirmed by the Indian Air Force. The last batch of five An-32 aircraft, which were sent to Ukraine for repairs, remains at the factory in Ukraine,” the ministry said in a statement. India and Russia are developing a medium-lift transport plane called UAC/HAL Il-214, which would replace the aging An-32 fleet. Russia's UAC and Hindustan Aeronautics have established a joint venture for the purpose, but the project is progressing slowly due to issues relating to production work sharing. Ukraine is undergoing a period of political and economic turbulence in the wake of the armed coup, which deposed President Viktor Yanukovich last year and imposed an anti-Russian government in Kiev. The new elected government is pursuing a policy of severing economic ties with Russia, adversely affecting some industries like the defense sector in both countries, which were historically interlinked. The Indian An-32 upgrade by Ukrainians involves shipment of parts from Russia.